I picked up the club archives from Mike Ishler yesterday. There is some good info in there, like what we paid for the repeaters and duplexers, antennas, equipment, etc. Old logbooks, awards, QSL cards, and various paperwork. The most interesting find were old club newsletters and meeting minutes. These are by no means complete, but is still a good amount. I have to thanks all the previous club secretary’s and other officers who kept these records. Newsletters pretty much stopped in the late 1990’s, with a couple of exceptions. Much club business and discussions took place via email, and eventually club news via website. The old websites are pretty much lost, though I think I’ve saved most photos, and some club meeting minutes are somewhere in the xarc@yahoogroups archives. I hope to be able to scan our old newsletters at some point. The 1981 ones are on the History page. I hope to be able to add some other info from the archives as well. For the time being, I’ve volunteered to be the home for the archives. Until I can’t. On Saturday, October 11, XARC sponsored its Fall Fox Hunt. Ned, W2NED, and Vince, W2VAB were hunt masters. We had planned the hunt to be a challenge for the most experienced hunters, but not too difficult for beginners. As usual, we all had a great time. Seven teams started and five teams found at least one fox. The top score was achieved by Jon, N2JAC and Laura, who found all four foxes for a score of 43. Second and third places were secured by Pete, W2SKY, and Bob, K2OID, who found three foxes for scores of 34 and 33 respectively. All hunters tell me that it was a very challenging hunt. Everyone was busy right up until the time we gathered for lunch at the Fruit and Salad Company in Bushnell’s Basin. We met at the north end of the Tinker Farms Nature Park at 9:00 AM for registration and practice. At 9:30 the hunt began, and three of the four foxes could be heard form the starting location. 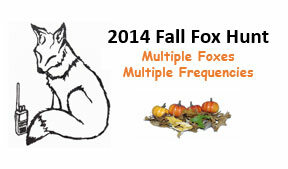 Each fox had a unique number, frequency, tone, duty cycle and data rate. Although not advertised in the beginning, the fox numbers, tone, and data rate all increased for foxes one through three. We had hoped that this would become evident as one progressed along the path from the start location in Tinker Park (upper left) to the final fox hidden along the Erie Canal. But, alas, things were not so simple. 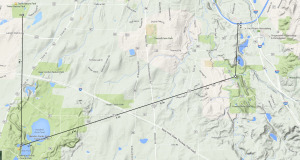 Fox One was located within the Tinker Farm Nature Park — less than a quarter mile south of the start location. 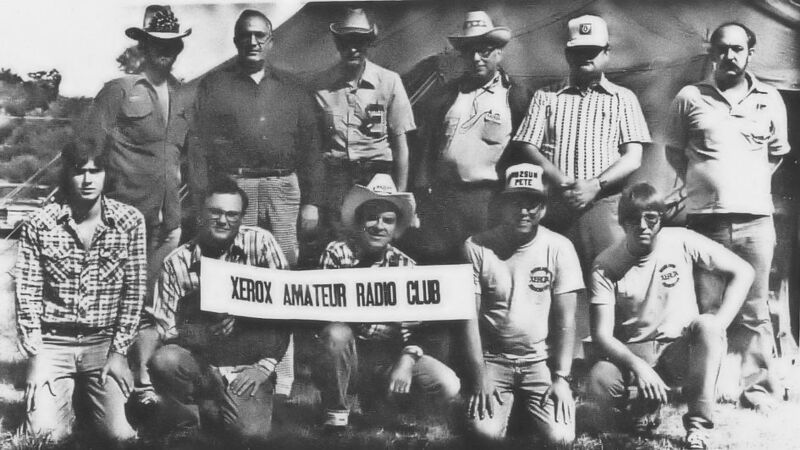 It was a low power fox with a short, “stubby” antenna. While two other foxes actually had stronger signals at the start, Fox One actually became much stronger as one walked south in the parking lot. Once this became evident, Fox One could then be easily located in the woods in the South East corner of the park. Foxes Two and Three were 6 watt transmitters with vertical coax dipole antennas. Both had strong signals at the start locations and were strategically located on high ridges in Mendon Ponds Park and Powder Mill Park. This caused the signals to appear to be everywhere as they echoed through the ravines and along the streams of the parks. It is just the sort of situation that makes fox hunting so interesting. Fox Four was located on the south side of the Erie Canal within a quarter mile from the lunch location. It was fairly easy to find once one discerned which side of the canal to look. Everyone found the hunt challenging, and it did meet the general objective of allowing newcomers to find at least one fox, while being sufficiently challenging to keep our best hunters interested. This hunt emphasized the fact that having a good hunt strategy is more important than having the best and most expensive equipment. More on this in future posts. I hope to see more hunters at the Spring Fox Hunt. Unfortunately, we aren’t fully automated, at least yet, so even if you indicate you will pay dues using PayPal, one must manually navigate to the Pay Dues page to actually perform the payment. So after you submit your membership application, go to the menu above and hover over Join XARC, then select Pay Dues or Donate. We hope to improve this in the future. The activation email may be flagged as spam by your email program or provider (mine was). If you system is webmail based (Gmail, Hotmail, Yahoo, etc), check the Spam or Junk Mail folder. If you use an email client (Outlook, Thunderbird, etc), you may have spam protection that diverts to a junk mail folder or similar. Some ISP’s filter email for Spam before it gets to you (RoadRunner and others). The only way to see this is to use their Webmail option and check for legitimate email that may have been flagged as Spam. In order to continue as a club, we need some minimum number of members, and collect modest dues to cover our costs. So it is that time of year to chip in for the upcoming year. It also wouldn’t hurt if we picked up some new members. So if every existing member could find 2 new members to join the club, we would be in excellent shape going into the future. I know I can think of at least two people who might be enticed to join our organization. Even if all of us only got 1 new member to sign up, it would be huge. So spread the word, tell them about our website, lets see if we can at least get 20 new members.